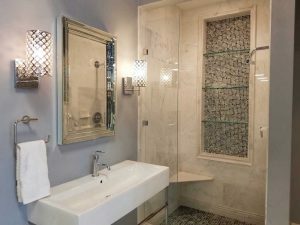 ​We believe that bathrooms are very personal, and should reflect the homeowner's personal tastes. While keeping in mind the space you have, or whether or not you can relocate a wall to make it bigger, your bathroom can be a show stopper. Wouldn't it be great to unwind in your modern garden tub, or be massaged by full body sprays in your new glass tiled steam shower? Dreaming of an opulent retreat? We have you covered. We are experienced in both classic and elegant designs as well as the modern, clean spa-like look. We have stock vanities to choose from, as well as custom cabinetry made in our own woodshop. We can design anything that you can imagine, from exquisite glass tile mosaics to imported travertine or granite. If you like handheld shower fixtures, or ceiling mounted rain heads-- as master plumbers, we can build the bathroom of your dreams. ​We provide Master Plumbers and Master Craftsmen for the installation of the fixtures required for your bathroom. We have recognized the need for quality and durable fixtures and cabinetry, as the bathroom is one of the most important rooms in your home. By using high quality materials and excellent workmanship, your bathroom will look beautiful and function perfectly for years to come. ​We recommend certain brands over others for their durability to stand up to heavy use. Oftentimes brands will carry lifetime warranties on parts that come in quite handy in the long run. We pride ourselves in our extensive knowledge of all plumbing fixtures and cabinetry that is available in the marketplace. We take calls 24/7. We offer 24-hour emergency services.